Deviled eggs are always a popular side dish or party snack. They aren't especially fussy, but they do require a bit of work: First, you have to hard-boil the eggs. Then, you need to carefully peel them, slice them, remove the yolks, mix the filling, and pipe in the yolk mixture. With everything else you're making for your Easter lunch, Memorial Day, weekend picnics, potlucks, or other get-togethers, you can give yourself a helping hand by making deviled eggs in advance — at least several of the steps. Here's how. Boil the eggs up to 48 hours in advance. Peel, cut in half, and remove yolks. Place egg whites on tray, cover with plastic wrap, and store in fridge. Make yolk mixture according to recipe. Fill a zip-top bag or reusable piping bag with the yolk mixture. Seal the bag, removing as much air as possible, and store in the fridge. Clip a small piece from the corner of the plastic bag. Pipe the yolk mixture into each egg white. Garnish, and serve. If you don't want to be piping as guests walk in your door, you can pipe ahead. Deviled eggs will stay in good shape—that is, the yolk mixture is unlikely to turn watery — for up to six hours if stored in the fridge. Pipe, garnish, cover, and chill to check the eggs off your list. Related: Get tips to make the best deviled eggs. Mini muffin tins: Pop each egg half into the well of a mini muffin tin — some larger ones have 24 spots — and cover with plastic wrap. Ice cube tray: Nuzzle each egg half into an ice cube spot. Cover with plastic wrap, and place in a box top or casserole carrier if you have more than one. Deviled egg carrier: You can buy a deviled egg carrier for less than $10. These handy trays are great when you want to make deviled eggs in advance and when you need to take them somewhere. Assemble at destination: If you'll have the counterspace and time, hold off filling the egg whites and garnishing them until you're at your final stop. All you need to do once you arrive is snip the end of the bag, pipe in the yolk, and garnish. This way, your perfect deviled eggs are presentable and you spare yourself some worry. Garnishes are to deviled eggs what cherries are to ice cream sundaes: Without one, the dish just isn't complete. But if you're making your deviled eggs ahead of time and storing or transporting them, you've got to consider the impact the extra moisture exposure will have on the garnish. In short, some garnishes will be soggy — and that's no good. Anything that isn't good without the crunch — bacon, nuts, crispy onions — as well as fresh herbs should wait until just before the eggs are served for the best texture and flavor. 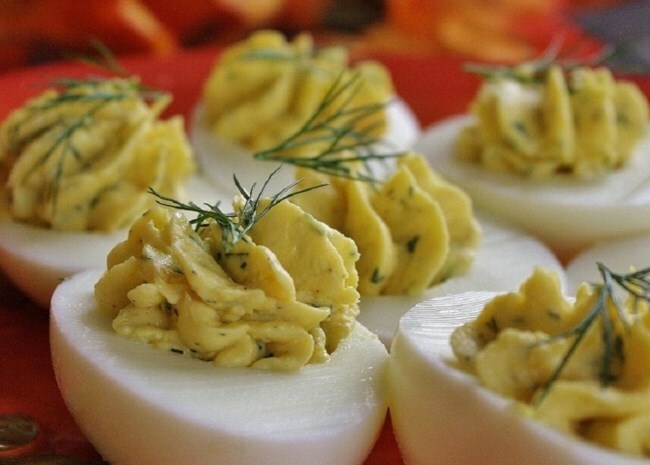 Check out our collection of Deviled Egg Recipes. Kimberly's favorite hobby is grocery shopping. Her second favorite hobby is realizing she already had two of the foods she just bought. Will bake. Won't grill. Can caramel. Find her at khollandcooks on Instagram and on Allrecipes.